Swivel Lock brakes are available in Hand-Operated models on Colson 4 Series, 6 Series, 7 Series, and 8 Series casters, and Foot-Activated models on Colson 4 Series. 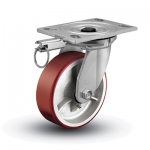 Capacity up to 6,000 pounds each | Swivel locks quickly convert swivel casters to rigid casters for straight-line tracking. A spring-loaded, hand operated plunger is engaged to fit into slots on the swivel raceway. To engage the lock, simply pull out plunger and turn until spring action inserts plunger in notches on raceway. 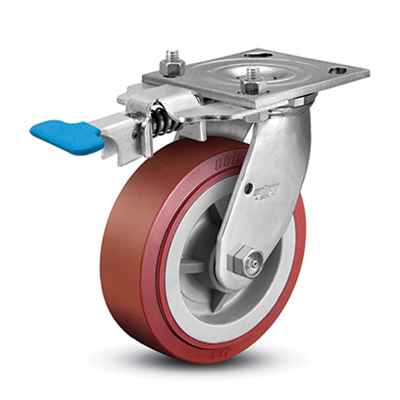 To disengage the lock, simply pull out the plunger and turn so plunger is not inserted in notches on raceway. 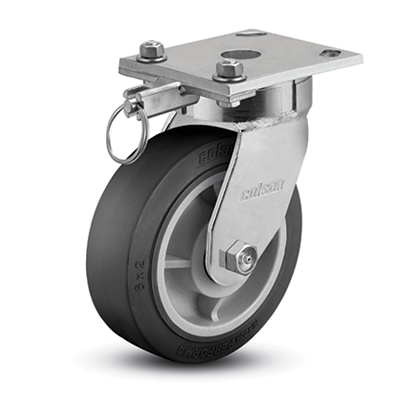 Colson offers 3 types of hand operated swivel locks: Welded, Bolt-On and Kingpinless. Colson’s welded swivel locks are factory installed only. They lock in 90° intervals on 4 and 6 Series casters. 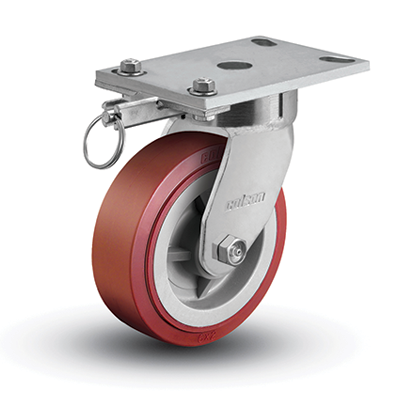 The bolt-on swivel locks are field installable only but require that the fork yoke base have notches at 90° intervals. They are available on 4 and 6 Series casters. 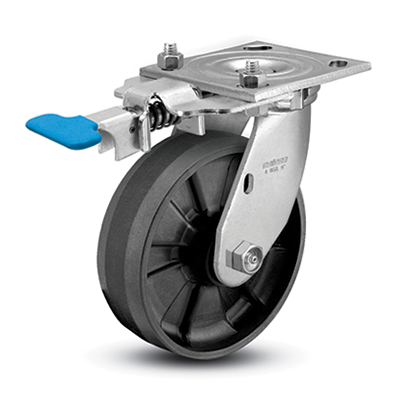 Colson Kingpinless Enforcer casters have notches in the raceway, so it is possible to field install swivel locks for kingpinless models. They lock in 90° intervals. Simply bolt the swivel lock on when you install on equipment. This swivel lock is available on 4, 6, 7 and 8 Series Enforcer casters. Capacity up to 1,500 pounds each | No more back strain from bending down to activate a swivel lock. When the foot pedal is in the “up” position, a stainless steel spring forces a pin into one of the four slots on the swivel fork. 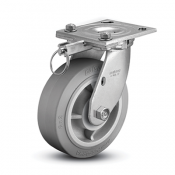 This effectively locks the swivel in one of four positions at 90° intervals. To disengage the lock, simply press down on the foot pedal for free swiveling action. It’s that easy! With this innovative product, you can quickly and easily convert swivel casters to rigid casters for straight-line tracking. 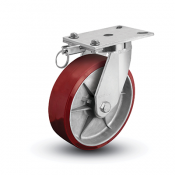 When you need greater maneuverability, you can quickly convert from the rigid position back to full swivel. Quick. Easy. Less stress and strain. The Colson Ergonomic Advantage™. 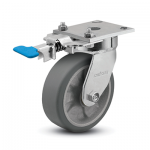 Foot-activated Swivel Locks are available on 4 Series casters.